He entered Jericho and was passing through it. A man was there named Zacchaeus; he was a chief tax collector and was rich. He was trying to see who Jesus was, but on account of the crowd he could not, because he was short in stature. So he ran ahead and climbed a sycamore tree to see him, because he was going to pass that way. When Jesus came to the place, he looked up and said to him, "Zacchaeus, hurry and come down; for I must stay at your house today." So he hurried down and was happy to welcome him. People love to hate a rich man. But they revile a generous fool even more. 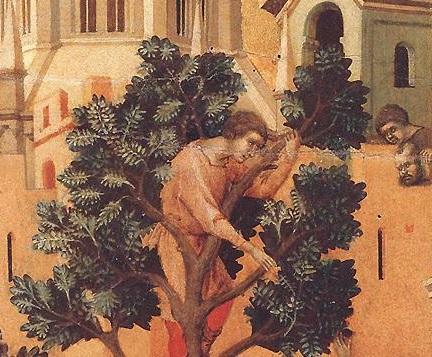 If Zacchaeus ever cared what people thought about him he could not have got wealthy, climbed a tree, or even paid restitution for fraud later on. The name Zacchaeus means “pure”. Despite a life of corruption, something in him remained pure in his deepest heart, making him ripe for plucking when Jesus encountered Zacchaeus in the sycamor tree. Blessed are the pure in heart, for they shall see God. Or be seen by God. Was there ever a faster conversion? Even Scrooge had to endure a night of hauntings before he turned. Zacchaeus, come down! I'm staying at your house! And how swiftly he ran, observes Augustine, to embrace the new life of salvation within his household (meditation one). For most of us, conversion involves suffering, detachment, purgation, painful self-knowledge, and radical change (meditation two). If love triumphs, however, the heart laughs in peace (meditation three). Oh! but he was a tight-fisted hand at the grindstone, Scrooge! a squeezing, wrenching, grasping, scraping, clutching, covetous old sinner! Hard and sharp as flint, from which no steel had ever struck out generous fire, secret, and self-contained, and solitary as an oyster. Had Zacchaeus what he had from good sources? Read and see. He was the chief of the publicans, that is, he was one to whom the public taxes were paid in: by this he had his wealth. He had oppressed many, had taken from many, and so had heaped much together. Christ entered into his house, and salvation came upon his house; for so said the Lord Himself, This day is salvation come to this house. Now mark the method of this salvation. 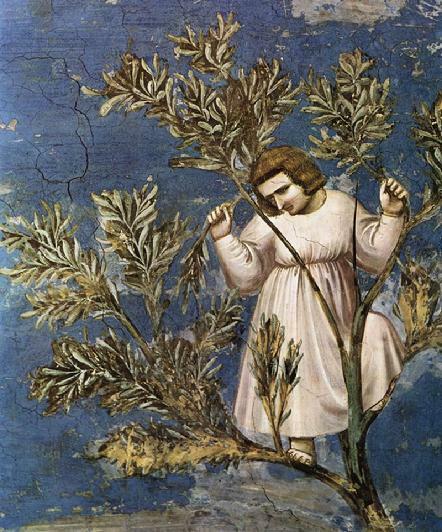 First he was longing to see the Lord, because he was little in stature: but when the crowd hindered him, he got up into a sycamore tree, and saw Him as He passed by. But Jesus saw him, and said, Zacchaeus, come down, I must abide at your house. You are hanging there, but I will not keep you in suspense. I will not, that is, put you off. You wished to see Me as I passed by, today shall you find Me dwelling at your house. So the Lord went in unto him, and he, filled with joy, said, The half of my goods I give to the poor. Lo, how swiftly he runs, who runs to make friends of the mammon of iniquity. By what avenue then has He entered? Or perhaps that fact may be that He has not entered at all, nor indeed come at all from outside: for not one of these things belongs to outside. Yet is has not come from within me, for it is good, and I know that in me dwelleth no good thing. I have ascended higher than myself, and lo! I have found the Word above me still. My curiosity has led me to descend below myself also, and yet I have found Him still at a lower depth. If I have looked without myself, I have found that He is beyond that which is outside of me; and if within, He was at an inner depth still. It is our terrible ability to refuse to become. � When we grasp that self is mere potentiality, something of our total dependency on God is forced upon us. It is a revelation most painful to human pride and yet the acceptance of this lies at the heart of all true growth. It is in the light of this imperative for man to recognize his true condition, that one can see blessed meaning in the afflictions, frustrations and ever-present curtailments and disappointments which are his lot. Without these, would we ever come anywhere near to a sense of truth? Oh, by all that love that constrained thee, who art the life of all that live, thyself to submit to die, be pleased to put to death in me all that is unpleasing to thee. To be a spectator of Reality is not enough. The awakened subject is not merely to perceive transcendent life, but to participate therein; and for this, a drastic and costly life-changing is required. Scrooge was better than his word. He did it all, and infinitely more; and to Tiny Tim, who did NOT die, he was a second father. He became as good a friend, as good a master, and as good a man as the good old City knew, or any other good old city, town, or borough in the good old world. Some people laughed to see the alteration in him, but he let them laugh, and little heeded them, for he was wise enough to know that nothing ever happened on this globe, for good, at which some people did not have their fill of laughter in the outset; and knowing that such as these would be blind anyway, he thought it quite as well that they should wrinkle up their eyes in grins, as have the malady in less attractive forms. His own heart laughed, and that was quite enough for him. While easiness of vision now is mine. How did Zacchaeus come to be so very ripe for the picking? Imagine an epic 19th century Russian type story with labyrinthine twists and turns, complex sub-plots with convoluted relationships and coincidences, hints and clues and foreshadowings like a mystery novel. The protagonist's very weaknesses will bring salvation to his soul. Finally, after this complicated set up, the rich man Zacchaeus wants to catch a glimpse of Jesus. Why? (Everything in the novel so far leads up to answering that question). Because he is small of stature Zacchaeus can't see over the crowd. Perhaps the crowd won't let him look at the holy man for the same reason he's barred from the synagogue. A son of Abraham gathering taxes for the Romans and profiting from this evil! So he runs ahead of the crowd and scrambles up a sycamore tree. Surely, in this novel, the sycamore carries some significant symbolism. We're seen that sycamore before, or its fruit or bark or wood. Perhaps Zacchaeus made dirty deals while drinking thick black coffee in the shade of the tree. Perhaps, as a young man, the former tax collector recruited him there, or blackmailed his family so that Zacchaeus had no choice but to enter this most despised, compromised and compromising profession. Jesus approaches, stops, looks up into the tree and calls up to our little anti-hero, “Zacchaeus! Hurry and come down; for I must stay at your house today.” From previous chapters we already know this house and household - the estranged but well adorned wife and unhappy grown children, slaves, hangers-on, despised and resentful tax-collectors working for their own despised godfather boss. What kind of disrupting upheaval does the reader predict of such an encounter under that roof? Imagine the tension! 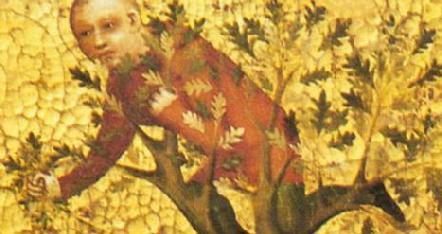 But wait... Zacchaeus hurries down the tree and “was happy to welcome him.” Well, the reader thinks, how many more pages are left? Will Zacchaeus turn this event to yet another profit? The crowd grumbles. Everyone in Jericho owes money to the hated Zacchaeus - some lost everything they owned to his merciless lackeys. Others seethe with envy only because Zacchaeus cleverly exceeded their own capacities for ruthlessness. And Jesus! At this instant the celebrated prophet loses his credibility. “He has gone to be the guest of one who is a sinner.” And the worst of Jericho's sinners at that! The once celebratory crowd begins to turn away. But in this thrilling denouement, Zacchaeus faces Jesus, speaking to him alone, but in hearing of the other characters beneath the Sycamore tree. “Look, half of my possessions, Lord, I will give to the poor; and if I have defrauded anyone of anything, I will pay back four times as much.” Imagine the bureaucratic nightmare of false claims, accusations, old stories stirred up by cashing in on Zacchaeus' radicalization. But as Jesus once said in Galilee, “let tomorrow's problems take care of themselves.” Let's eat. Who knows? Maybe Zacchaeus disappears from Jericho the very next morning leaving the reconciling of debts to a well paid aide. At the end of the novel, some traveler to Jericho mentions in passing that a sort of shade of the man they once knew as tax collector was among the disciples fifty days after that Passover, and he, too, appeared drunk with the Holy Spirit. An epilogue relates a final testimony, added to the martyrology of disciples: in some far country toward the ends of the earth, a devout Christian sang on his way to the gallows, hanged from a sycamore tree.